Guernsey FC secured an Isthmian League South play-off place following their 2-2 draw at Walton Casuals. Dominic Heaume's late equaliser got the point the Green Lions needed to secure fourth place in the table. Ryan-Zico Black's free-kick gave the Green Lions a first-half lead, but Gabriel Odunaike struck twice to put Walton 2-1 ahead. Guernsey's Marc McGrath had a penalty saved before Heaume struck with the help of a goalkeeping mistake. Guernsey's final game on Friday. If the Green Lions win they will play Folkestone in the play-offs, but if Invicta win the Green Lions could face Leatherhead, who are currently second. 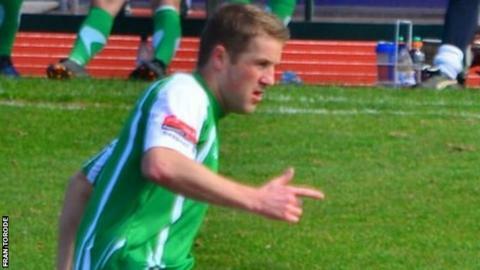 "I'm a bit relieved to be fair," Guernsey manager Tony Vance told BBC Radio Guernsey. "We were in a controlling situation at 1-0, so much in control that it was bit of a flat first half and we didn't really get out of second gear. "Second half we made two poor mistakes to let them back into it and take the lead. "It got a bit scary towards the end but it was good to see Matt Loaring and Dom Heaume come on and Dom to get the equaliser."